ALERT2 is a modern communication protocol that improves upon 40 years of tradition within the flood-warning community. ALERT2 has been designed to improve the performance of traditional ALERT flood-warning systems by reliably providing accurate and timely data. Since 2014, Campbell Scientific has provided a line of ALERT2 transmitters and customized solutions designed to meet customers’ specific needs. Over the course of 2015, Harris County Flood Control District (HCFCD) customized and installed a Campbell-based ALERT2 upgrade to their flood-warning system (FWS). HCFCD partnered with two experienced Campbell Scientific integrators to complete the installation and training of personnel on the new hardware: David Haynes of Distinctive AFWS Designs, and Don Van Wie of Telos Services. Harris County, Texas, is home to over four million people and is the third most populous county in the U.S. The goal of the Harris County FWS is to provide accurate, real-time rainfall and stage data to facilitate crucial decision making before, during, and after flood events. 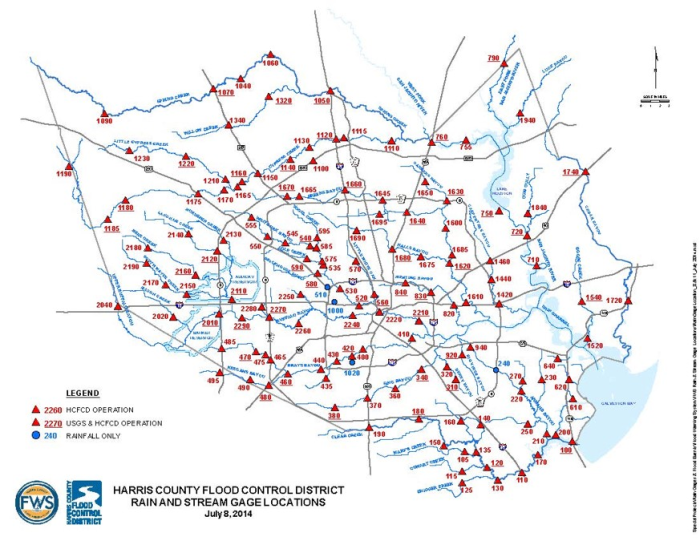 The Harris County FWS relies on 139 gaging stations placed throughout the county bayous and connected tributaries of 22 watersheds. The flood-warning network originally consisted of 13 stations installed in 1982 and grew to include today’s 139 HCFCD stations. However, during 34 years of system expansion, significant growing pains emerged. Network expansion, aging equipment, and maintenance practices created unacceptable data loss and quality by 2007. Campbell Scientific offers turnkey FWS solutions, including the ALERT200 and ALERT210. With the help of Telos Services and Distinctive AFWS Designs, the FWS was reviewed from top to bottom, the project went out for competitive bid, and the final solution was to replace all the equipment to customized Campbell ALERT2 systems. Over the summer and fall of 2015, the network was systematically upgraded with Campbell equipment. The network ended up with 90 systems that consisted of an AL200 and a radio, while an additional 60 systems utilized a CR800 datalogger. During the upgrade process, the HCFCD took the opportunity to also update all of the site infrastructure, including new antennas, new 5 W solar panels, and site arrangement. There are many ways to assess the success of a flood-warning network. For the sake of this article we are going to look at percentage of successful reports during normal conditions (non-storm event) and peak rainfall events for pre-upgrade, during upgrade, and post-upgrade to ALERT2. To analyze reporting success during quiescent conditions, Mark Moore of the HCFCD examined daily, scheduled reports. In 2012, only 82.0% of battery reports arrived as expected. Continued upgrades to the system increased this success rate nominally to 84.9% by 2014. However, the completion of the upgrade to ALERT2 with Campbell Scientific gear increased the percentage of successful daily scheduled reports to 99.5% by the end of 2015. Understanding the availability of data during dry periods gives insight to network performance, however major rainfall events test the true reliability and resiliency of the system. One weakness of the original ALERT networks was lost data or transmissions due to message collisions (too many stations talking at once on a common frequency). Communication traffic in an ALERT system is a function of storm intensity and spatial extent; therefore, as the need to receive data increases, the chance of losing data also increases at the time when the data are most important. Prior to system upgrades, the overloading of radio frequencies in the HCFCD resulted in the loss of up to 60% of gage data during large events. For example on Memorial Day in 2015, Harris County received excessive amounts of rain, with some gages showing over 7 in. of rain in less than three hours. At this time there was only one ALERT2 test site installed, and the rest of the network was still legacy ALERT. As designed, the ALERT2 test site received 100% of its expected data reports during this extreme rainfall event. In comparison, only 65% of the expected reports were received from nearby legacy ALERT stations. During the system upgrade to ALERT2, the HCFCD took steps to reduce data loss from collisions, including reducing background radio interference, installing correctly functioning equipment, and using ALERT2 concentrator repeaters. Since upgrading to ALERT2 with Campbell equipment, HCFCD can calculate how much traffic the system can handle before any performance degradation is observed, and can plan accordingly. The ALERT2 network installed in Harris County was tested once during the installation process when the system was 35% legacy ALERT and 65% ALERT2. Near the end of October 2015, the remnants of Hurricane Patricia dropped 8 in. of rain in Harris County over a 24 hour period. During this storm event 99.6% of transmissions were successfully received from 90 ALERT2 stations. Since its completion the system was tested with a minor rainfall event in December 2015, and a moderate flood event in March 2016. During the minor rainfall event in December, 2.5 in. of rain fell over 48 hours. An analysis of the 15,000 reports generated during this event showed that 99.9% of expected reports were received. Between March 6 and March 11, 2016, parts of Harris County received 2.5-7.4 in. of rain. Multiple watersheds experienced over-bank conditions during the storm event. Looking at the roughly 13,500 transmissions during this event, the average success rate for receiving data into the database at the base station during the storm event was 99.8%. During the worst hour of the storm, success fell to 98%. By upgrading to ALERT2 hardware and updating infrastructure, HCFCD has been able to reduce gage down time and the length of preventative maintenance visits. The site upgrades allow for easier access to equipment. For example, the technician no longer needs to remove the transmitter from the standpipe just to replace a battery. It is also easier to check sensor calibrations because the technician can connect directly to the DCP and view finished values in real-time. The technician will no longer need to check software for decoded messages. The hardware upgrade has also made repairs easier. The components are modular and easy to replace. The technician will no longer need to pull the whole transmitter. Plus off the shelf sensors can be used to replace damaged units without requiring a specialized circular connector. More responsibility falls on the technician with these upgrades. For example, a poorly tinned wire may cause sensor issues; however, wiring issues are much simpler to diagnose and repair in the field without needing any special equipment. Multiple battery connectors make battery exchange easier and possible without powering down the site. Direct, easy access to the SDI-12 bus allows for easier diagnosis of problems. All this means less money spent on maintenance and repair. This money can be spent on further improving the network. It also means less time spent on site, which is important since many sites are located on roads and bridges, and traffic needs to be diverted while work is being done. Since field-based preventative maintenance takes less time, HCFCD has decided to add general site management to the visit, including tree trimming, weed eating, etc., to allow for discharge measurements during storm events and better rain capture. Harris County has been working to shift their mind set to include preventative maintenance in the office before a problem arises. For example, as each gage sends a status transmission six times a day, operators watch out for any gage that misses its four hour report. Sync status updates allow HCFCD to confirm that the transmitter is getting a good GPS signal, and repeated instances of high sync status values lead to investigation. Battery reports on a more regular basis allow them to diagnose a failing battery before it goes bad. They have removed six failed batteries from the field before those sites went completely out. In fact, because of the more regular battery reporting, HCFCD hasn’t had a site go inactive due to battery failure. In conclusion, the HCFCD staff members are confident that the Campbell Scientific ALERT2 upgrades to the FWS will allow the system to fully meet its goal of providing accurate, real-time rainfall and stage data to facilitate crucial decision making before, during, and after flood events. Campbell Scientific would like to thank Mark Moore of HCFCD for sharing his analysis of the pre- and post-upgrade successful reports.